A crisp, bone dry version of this versatile grape from the Clarksburg AVA near Sacramento. 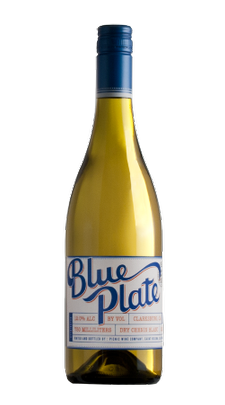 I guess it’s called “blue plate” because it’s a utilitarian wine—solid and inexpensive. Melon and subtle honey notes rest on a background of faint apricot, all gently cloaked in a funky wet hay aroma.On the palate it’s peach upfront with a lanolin infused midpalate. The slight viscosity gives it a pleasing softness set off by dominant stony, minerality that rushes quickly into a seriously tart, slightly bitter finish with good length. Domestic, dry Chenin Blanc is worth buying. It’s not insipid like too many Pinot Grigio’s, not as in-you-face as Sauvignon Blanc, and more lively than budget Chardonnay.